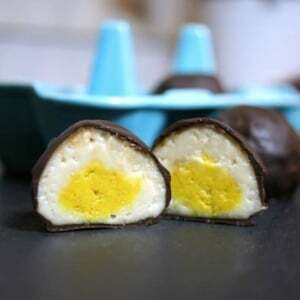 An easy and all-natural alternative to Cadbury Creme Eggs! Combine the coconut butter, raw cashew butter, and maple syrup in a bowl and stir well to combine. Scoop two tablespoons of that mixture into a separate bowl and add in the 1/4 teaspoon of turmeric. Stir well to mix, creating the yellow "yolk" filling. To create the egg filling, scoop 1 tablespoon of the white filling and roll it between your hands to create a ball, then press it flat. Scoop 1/2 teaspoon of the yellow filling and place it in the center of the white filling, as pictured below. Wrap the white filling around the yellow filling, and roll it into a ball, as pictured above. Repeat with the rest of the mixture, creating about 8 small eggs. Place in the freezer to set until firm. These eggs can be stored at room temperature for several hours, but if you don't plan on serving them until the next day, I'd recommend keeping them in the fridge overnight so they don't spoil. Enjoy chilled or at room temperature!